Readers have written in to say that it was not the job of the IPCC to provide a self-contained exposition of the scientific issues pertaining to increased CO2. I’ve looked at a couple of statements of the role of the IPCC and there’s certainly nothing that prohibits them from providing a coherent explanation. One of the differences between the attitude of climate scientists and the public to IPCC is that realclimate scientists put the priority on IPCC as a literature review, while I believe that the public presumes mistakenly that the IPCC carries out independent due diligence, like an engineer or auditor would. Clearly review of recent literature is central to the mandate expressed above. Now here is another statement of IPCC’s role, which is related to the above, but different. You’ll notice that review of the latest literature does not appear in this statement of role, although the latest literature would obviously be relevant to discharging the assessment of information set out in this statement of role. The second one seems to be the older statement. It would be interesting to know when the phrase about reviewing the latest literature was inserted in the IPCC mandate and whether this phrasing was approved by member governments or merely by the secretariat. This entry was written by Stephen McIntyre, posted on Jan 8, 2008 at 3:44 PM, filed under General. Bookmark the permalink. Follow any comments here with the RSS feed for this post. Both comments and trackbacks are currently closed. Shortly after Little Big Mann’s Testimony? What we do know is that the US, Saudi Arabia, and China ensure that whatever the IPCC says, it is very conservative. By many estimates, the IPCC is under reporting the state of global warming to the world, if you will. What makes you believe the public presumes this is what the IPCC does? What percentage of the public presumes this? The answer to your question is 90% of the public believes the UN-IPCC is peer reviewing the peer reviewed science and formulating a definitive conclusion on AGW. And 50% of the public believes that all 2,500 IPCC scientists are in total consensus and there is no scientific debate any longer. That is what people like Al Gore are saying and most people believe Al Gore. Just how does anyone think they can accomplish this by ignoring the details? The vast majority of the public, in fact. Just take the time to listen around you when the AGW comes up. You’d be astonished who actually believes this. Most also believe that the IPCC consists of some 2500 independent scientists, who together with Al Gore won the 2007 Nobel Peace Prize. Not surprisingly, that’s what you get when the mainstream media tell the public this for years on end. The issues SteveM raises are spot-on. It is sometimes overlooked that the IPCC has a very specific mission. Read both the excerpts highlighted by SteveM above, and one will find that under the purported over arching concern with climate change the true subject of interest is “human-induced” climate change: i.e. : “to assess.., the scientific basis of risk of human-induced climate change”. Over the course of its various reports, explanations based on naturally occuring climate variability, although acknowledged, as a rule have been downplayed. Eric McFarland, when are you going to stop making unsupportable statements? Your starting to seem like a joke put on the internet to annoy me. The IPCC is “understating climate change” huh? So why are we undershooting there projections even at the high end of their “scenarios”, huh? If anything, they seem to be overstating there level of certainty, given that they level of scientific understanding of non-greenhouse effects is low. How does this correspond to 90% certainty, which wasn’t calculated, but found by asking people, how sure are you? Dressler actually admitted that’s how they got the figure. What person in there right mind thinks the Saudis and US run the UN? Maybe the Saudis, but the whole purpose of the UN has become to “level the playing field” which means compete against the US. All countries have a say in appointing members. The US is not in control of the IPCC. What world do you live in, Eric? Brian, many people believe that. They trust the IPCC. They want to base policy off what they say. They think that the IPCC is a “consensus” of scientists who all think that we are going to die and we had better act. The answer to your question is 90% of the public believes the UN-IPCC is peer reviewing the peer reviewed science and formulating a definitive conclusion on AGW. And 50% of the public believes that all 2,500 IPCC scientists are in total consensus and there is no scientific debate any longer. 2. hide research that runs counter to the general global warming thesis. I assume this was meant as “real climate scientists” and not a reference to the web site, realclimate? The cut off for AR4 was mid 2006, so we are now barreling toward 2 year old peer reviewed articles in this representation of…. What is the acceptable standard or proof … by what standard to we measure risk? Thx for opening up the IPCC mandate/basis for conclusions can of worms. It is now undeniable that governments in the OECD group of developed economies are looking to implement far reaching policies based on [or in the face of, see below] IPCC “findings” about AGW/ACC. Well informed sources have it that the UK government will announce on Thursday a full scale adoption of new nuclear electicity generation technologies. Meanwhile the German government all political correctness set aside, has approved the building of over a dozen new coal fired power plants. On a different note, large scale efforts are underway in China to adopt GMO rice varieties that would allow the farmers using them to claim carbon credits. I’m sure it would interesting to hear Pielke Sr’s views on that one. To the point: there are several salient elements overlooked by the mainstream media in their coverage of the Bali IPCC meetings of December, 2007. 1] unless ALL countries are on board, no new deal. 3] The 2007 IPCC reports [based on the Q4, 2005 cut-off date] are now longer the yard stick and any decisions in the run-up to Copenahagen 2009 will be based on “emprical data and observations”. In other words, the IPCC’s GCM “projections” [Trenberth’s protesations regarding that term notwithstanding] will no longer be taken at face value. Pls keep up the good work. As I have flagged on one of the other CA threads, the mainstream media are starting to pay serious attention to the threadbare nature of the emperor’s wardrobe. Based on all that is known in the realm of physics, when you push an anvil off a roof it doesn’t levitate and hang there; it comes down. Mannian Climate Science being what it is, is a bit more convoluted. Might I suggest that the standard by which you measure risk is your willingness to stand in the vertical pathway of said anvil. I still have not seen an actual and direct refutation of Mann’s basic conclusion. Can you refer me to one? Then look at the legend above on the left hand side. Go to Categories, then MBH98. There is a lot there. It has been repeated by journalists and AGW-supporters again and again as the ‘consensus view’ and ‘prooffe’ that AGW is indisputable. Give me the one go to article that sums it up … why Mann’s basic conclusion is dead wrong. I don’t want battles over footnotes. Thanks. Paris–The signs of global climate change are clear: melting glaciers, earlier blooms and rising temperatures. In fact, 11 of the past 12 years rank among the hottest ever recorded. After some debate, the scientists and diplomats of the Intergovernmental Panel on Climate Change (IPCC) issued their long-anticipated summary report in February. The summary describes the existence of global warming as “unequivocal” but leaves out a reference to an accelerated trend in this warming. By excluding statements that provoked disagreement and adhering strictly to data published in peer-reviewed journals, the IPCC has generated a conservative document that may underestimate the changes that will result from a warming world, much as its 2001 report did. The IPCC fails us for the same reason other large organisations do. They simply ignore their rules. The IPCC is governed by rules agreed by international agreement. However unlike Enron when they blatantly ignore them there is no law enforcement agency with the jurisdiction to hold them to account. I, and I suspect many others passionately concerned about the IPCC reports, did not read the Principles Governing IPCC Work until Steve pointed out that under the rules he should be able to see reviewers comments. Equally important is Appendix A, which among other things gave Steve the right to see the data (refused by Dr Solomon) he asked for. Under Appendix A, 4.2.4.1 all the unpublished data, which is used in papers cited by the IPCC should available to reviewers. If TAR reviewers had been on the ball and the IPCC stuck to the rules there would have been no hockey stick. The words in Clause 2 of the Principles  comprehensive, objective, open and transparent basis have real meaning and if the IPCC process was amenable to UK or EU law might well cause them real problems. In the UK the greens forced the government at very considerable cost to redo the consultation process on nuclear power. em, your slide is in backwards. The problem with Mann’s work is that it tries to make claims that are not supported by the data. Asking someone to sum up why Mann’s basic conclusion is dead wrong is like asking someone to sum up why the daily horoscope in the paper is dead wrong. In other words, even if it is right it is a coincidence and no science should be derived from Mann’s work or any of the variants. Climate change is a very complex issue: policymakers need an objective source of information about the causes of climate change, its potential environmental and socio-economic consequences and the adaptation and mitigation options to respond to it. A logical person would wish the science and engineering to be understood before remediation was adopted. But the IPCC has worked in non-logical sequence before, like publishing FAQs before the Report. So I had thought that, the “science being settled” with a “very high” confidence, we might be seeing some remediation reporting. Anyone seen any, or is the IPCC still too uncertain to make recommendations on adaptation and mitigation? Re #22. Thanks David Holland for reminding us that it was Steve who drew attention to the IPCC “Principles …”. enabling him (and all of us) to have access to reviewers’ comments and authors’ responses to the IPCC WGI Report. As the Principles are presumably equally applicable to the WGII and WGII Reports, perhaps the Technical Support Units for those Working Groups could be persuaded to make available the reviewer comments and authors’ responses to those reports? As a seasoned survivor of the bureaucratic system, mainly as a result of having to cope with a local IPCC type of regulation, I wonder, (in the Humphrey Appleby sense) what possible inducements one could offer to get the reviewers comments and authors’ reports? Perhaps I might link here to the comment I made on an earlier thread before Steve started this one. The Review Editors have an important role in the process and “must” submit a report. Appendix A says “…Review Editors will need to ensure that where significant differences of opinion on scientific issues remain, such differences are described in an annex to the Report.” I do not think this happens in Chapter 6 (and perhaps others). If the the Review editors did their job their reports should enlighten us as to why. I am pressing to see the Chapter 6 Review Editors’ report. It may reveal nothing but on the other hand almost everything so far that that has been released only after a fight shows either poor science or poor process. The science is important but I do not see as likely a killer blow from either side. Jo public and more particularly politicians begin to distrust organisations that are shown to be cavalier with the rules. By many estimates, the IPCC is under reporting the state of global warming to the world, if you will. Scroll down to see GISTEMP, UAH MSU, NCDC Absolute, NCDC Anomaly, RSS MSU, CET, HadCRUT3, SIDC, latest quarterly radiosonde update and HadAT. I have no doubt that out of the hundreds (thousands?) of researchers involved with the IPCC, there are many different views as to the severity of global warming. By definition, any report that does not reflect the most extreme views can be construed to be “hiding” those views. However, every single one of those researchers is free to publicly state their disagreement with IPCC conclusions, as, indeed, the link you provided proves. Since I am bombarded daily with apocalyptic warnings about global warning, I cannot take seriously any notion that the problem is being downplayed. That doesn’t make sense. There’s nothing to stop them doing anything that’s not specifically addressed. They review the literature in the sense that they see what is available, they don’t go out and audit it. The scientific method, if it is working properly, presents them with pre-audited science, that is, it has been reviewed. They can’t go into details on every piece of science they use to create their reports. They do reference the science. If you want more detail, it is up to you to chase up the references. For science that is well accepted, read a text book. As has been pointed out here many times, including by many AGW proponents, peer review does not provide detailed review of either the data or the methods. Articles which are peer reviewed have only passed the “Smell Test”; i.e. the material in the article is “Plausible” to use the NAS term of art. Since we know that peer review is nothing close to auditing data and methods, then the question is why anyone would believe the findings of the IPCC unless they did the auditing themselves. And if the policy makers don’t insist that this auditing be done, then their recommendations should be resisted. Strictly speaking the even-handed treatment of pro and anti AGW positions here isn’t necessary, though it’s helpful. Until there is a clear audit trail for the pro-AGW position, any attempt to implement the policies stemming from such a position should be rejected. Period. Give up the ghost with Eric. Human nature is to create a hypothesis in your mind and then look for all evidence to support it, while at the same time filtering any evidence against your hypothesis. In fact, said person will twist anything that even remotely involves their hypothesis to support it and will go to great lengths to ignore direct evidence refuting it. This is why conspiracy theories are so prevalent. They match the formula that we follow already. A good example of this is an abused partner. His/her hypothesis is that their partner is a good person and they look for anything to support that claim. They will argue it right up to the moment that their partner kills them. We all wonder how that happens but ignore the fact that we all do it to a certain extent. It’s why double blinds are done. In short, when a person shows an unfathomable obstinate bias to their view, we must understand that anything we say is pointless. By bother? It’s easy to see Eric follows this pattern. Move on, there is plenty to discuss with Steve’s original inquiry about what role the IPCC plays. Should they be required to provide all source material for their assumptions? I think so, and I think that the image they are giving the public is deceptive and thus needs and audit itself. Eric McFarland (#20) – while the proprietor of this site and its regular inhabitants feel free to complain about the IPCC not explaining things clearly enough, they feel under no similar obligation to clearly set out their refutations. I asked for almost exactly what you asked for when I first visited here, the best expositions here of the case against any facet of “AGW” or the IPCC. And I got essentially the same response – “look at the links on the left”, “look through our 2500+ pages of archives”, “look at these articles on some other website” – obviously that didn’t make the case for me 🙂 I’m not sure why it seems to satisfy most of the others here, other than through implicitly reinforcing preconceived opinions by attacking minutiae without being explicit about any big-picture items. The truth is, there is no coherent argument against the fundamental conclusions, so the only argument that can be raised is to question the objectivity and competence of the scientists involved – some of whom have, like any humans, made occasional mistakes. I have found no persuasive arguments questioning the basic science here anywhere. The claims of the IPCC have not been proven scientifically. The IPCC presents a scientific opinion and is demanding some extremely radical investments on the part of society because of that opinion. The credibility of the IPCC and the scientists who dominate it is an important issue when it comes to evaluating the opinion of the IPCC. Certainly with the current crop of threads regarding IPCC, your wish has been fulfilled. However, you ask for best exposition of the case against AGW/IPCC yadayadaydaa. But how might one develop a case against IPCC without understanding the scope of the charter and the intent of the organization. Otherwise, one might develop the case and find a valid objection to be “oh, that’s not what we were supposed to do”. Oops, that’s the subject of this thread. As for your more general issue (which belongs in other threads), perhaps you haven’t looked very far. In other words, you still haven’t read the blog. Warmers are to be spoonfed, but skeptics must ‘do their homework’. Sorry for my ignorance, but could someone give me a reference to a useful discussion of “adaptation and mitigation” of the impacts of climate change as called for in Steve’s quote above? Eric—“may underestimate”, “environmentalists say governments tried to weaken reports”, uh, ok. BTW, the “drafts” that you linked to are editorials from newspapers, not IPCC drafts–Syntax is very important here. ArthurSmith–“fundamental conclusions”—-of what? As SteveM has correctly pointed out in numerous postings, no person has given any exposition of the “fundamental conclusions” that you speak of. If it is so “fundamental”, then prove it—Junkscience will give you $150k USD if you do so.–Good luck. What is “objective” about making a claim of AGW, and inserting absolutely no counter-arguments that would refute the AGW claims? –don’t just gloss over it, read it, and you will understand the inherent flaws of MBH98. Arthur, Eric, is it not enough to show that the Hockey Stick is based off of bad methodologies and data to say you can’t trust it? Is it not enough that when you run models based upon the typical assumptions of how the climate worls, they don’t produce a flat or steadily cooling climate until the last hundred years? Is it not enough that you can find a MWP and LIA is most reconstructions? Is it not enough that if you use the proper methodologies, they Hockey Stickebreaks? Is it not enough that there statistical analysis fails without bristlecones? There conclusion may or may not wrong, but this “fake but accurate” stuff doesn’t cut it it serious science. The IPCC doesn’t use the Hockey Stick anymore, so there conclusions have been shown to be so difficult to stand behind (ie, no evidence) that the IPCC prefers to stand behind 12 different reconstructions, which generally don’t show the lack of any variability until recently. There hypothesis is not impossible, but its highly unlikely. Flat Climate is almost certainly a myth. The refutation of the “hockey stick” is often mistaken as an attempt to refute GW (or more particularly, AGW), which is a strawman to say the least. Refutation of the stick simply calls into question assumptions about past temperatures, i.e. they remain unknown. Mann’s general conclusions of unprecedented warmth simply aren’t supported by his reconstructions, but that doesn’t draw any distinctions as to whether or not AGW is true or not. I run into this problem all the time when discussing AGW – believers assert that AGW is indisputable but can’t seem to define what they mean by it. Please state in a single sentence what either (or each) of you believe to be “Mann’s basic conclusion”, and I (probably the least qualified lurker here) will refute it to the best of my limited abilities. I don’t want to hijack this thread any more than it already has been, so I hope to see you over in Unthreaded. while the proprietor of this site and its regular inhabitants feel free to complain about the IPCC not explaining things clearly enough, they feel under no similar obligation to clearly set out their refutations. I’ve started working through some of the physics material with some reluctance, because I have a vast amount of unfinished business in the proxy area that’s worth reporting on more formally. People want to talk about the physics because that’s the “big picture”. You say: ” the truth is, there is no coherent argument against the fundamental conclusions”. That may well be the case. If the “fundamental conclusion” is that the expected impact of doubled CO2 is 3 deg C +- 1.5 deg C, then I’m certainly not in a position to say that that conclusion is wrong, nor have I ever done so. Before I ventured such an opinion, I’d like to understand exactly how the result was calculated and, only then, would I venture an opinion. In trying to understand this, I’ve expressed frustration with the apparent IPCC failure to set out exactly how they got there. I’ve made it clear that this doesn’t mean that the arguments are wrong, just that the verification trails are tangled. Frustration with the IPCC exposition has nothing to do with whether I’ve pulled together a formal article on the other multiproxy reconstructions for publication. This is just me; I can’t clone myself. I intend to do such an article, but I’m also trying to respond right now to reader interest in other topics. Yes, an article on other recons is long overdue; McKitrick has bugged me about it. But that’s nothing to do with the quality of IPCC exposition. That was a big budget, high-profile and influential publication and I’m entitled to comment. The IPCC has some good information on this. However, the executive summaries are written to be read. If you want the the basis you will need to get the Work Group Report. Unfortunately, it is hard to get the underlying assumptions to some of the price and costs. This makes computing the price benefit ratio suspect. I tried doing this but had to make too many assumptions. However, to keep this on thread, when I ran the numbers with the assumptions that I had to make to get the cost/benefit ratio, it appeared that Kyoto benefits for mitigation was off from 1.5 to 2X, from adaptation for assuming that the 2X CO2 would be about 2C. I think just as they have not been open and transparent in several areas., what I could gather applies to the mitigation/adaptation that IPCC should be proposing. In the WG Reports adaptation is shown to be equal to mitigation especially in the short term, it may be much better, yet the advantage of adaptation does not appear to have much ink or follow through by the IPCC. I hope that the work from Bali will address this undersight. Here is a clear refutation: Mann and others have produced temperature reconstructions which show no medieval warm period. There is currently a glacier retreating in Greenland which is uncovering plant material from under the glacier which has been radio carbon dated to approximately 1,000 years old. Mann made no allowance that his reconstruction was regional, ipso factohis reconstruction fails to reconcile with empirical observations. Dispute this. I reiterate, Mann made no mention of regionality, so adding it now refutes nothing, except any claims to credibility for your argument should you try. I dispute it. Mann and others attempted to make hemispheric reconstructions, not regional ones. The success or failure of their efforts cannot be judged against regional or local climatic anomalies. So much for a clear refutation. The Medieval warm period in the North Atlantic region is well known. What is less clear is whether this anomaly is regional, or has a hemispheric or global extent. “Spatially resolved global reconstuctions of annual surface temperature patterns”……MBH98. Yeah, that sounds like what you said. Not. Once again we have the situation that skeptics must prove the negative – obviously impossible. Arthur, I would respectfully suggest that you actually read TAR and AR4, where it is clearly stated that our scientific understanding of the majority of factors widely believed to affect climate is “poor” or worse – IIRC, they list 11 factors, and 7 have a very low understanding (the actual number may vary, but to the best of my memory, this is at least close). They then suggest that they have “90% confidence” that recent warming is anthropogenic. This does not seem to me to be a tenable position – if 2/3 (roughly) of factors known by IPCC to affect weather and climate are not well understood, how can we reach a 90% confidence level that one of the known (albeit, well understood) factors is solely, or even mostly, responsible? I cannot see how, but would be pleased to be enlightened. Have you read beyond the first line of the abstract? Mann’s reconstruction is spatially resolved, but the only part that anyone ever seems to care about is the hemispheric mean. It would be possible to use the model to look at smaller geographic areas, and the paper show this (as maps not timeseries). So, other than those published by MBH and the Team (the flawed bristlecone pine-dominated studies), can you name any contradictory studies that have been left out of this analysis; i.e., studies that show there was NOT a MWP? That’s a nice concession re Mann — i.e., no “go to” article refuting Mann’s basic conclusion, in fact, exists. And, if it were such a clear slam (as many of the posters here suggest) one would assume that such an article would be easily written and published — and as quickly as possible (especially given the urgency of the issues involved). At any rate, the proof has apparently come out in the pudding on this one. Please state Mann’s basic conclusion. RichardT and Arthur Smith are in the process of hijacking this otherwise important thread, the main contention of which they do not appear to approve of, by attempting yet again to glue back together the thoroughly ground-up Mannian “Hokey Schtick”. Other than some particle board, there nothing to be gained by playing their game. My suggestion: “no contact” hockey. Let them skate. Sorry, forgot to include Eric McFarland. Thank you Eric. The key word in your post, and the crux of the argument is “unprecedented”. This can only be supported by Mann’s hockey stick, the specific articles which refute, if not shred this are MM03, and MM05. These papers are available on the left hand sidebar of this blog. There is your reference. Did not Von Storch say the argument was in the shaft … and not in the blade? Thread etiquette suggests you stay on topic in this thread. There are plenty of threads on MBH, the NAS report, and Von Storch for you to play in. There’s even an unthreaded thread. I find it plausible that you are aware of and can observe these web niceties. Some scientists believe the dispute has more political weight than scientific significance. That’s because, they say, other studies of past temperatures also indicate they are higher now, on average, than at any time in past 1,000 years, and perhaps far longer. “A number of studies all come to the same conclusion,” Dr. Mann said. That was 2005, has there not been anything learned since then? Perhaps the WSJ is biased because it referred to “Some scientists” instead of the consensus? The WSJ does occasionally carry an article or opinion on AGW issues, and even presents both sides of the issue, as contrasted to the majority of mainstram media outlets. Eric, you are arguing in circles. You asked for an article which refutes Mann’s basic conclusion. His conclusion as stated by you is that current warming is unprecedented. I gave you two papers, as you asked, which put paid to the basis for unprecedented warming, the hockey stick. Do you respond to or read the papers in question? No. You go for sleight of hand. Refute the MM papers, or concede the point. You seem to state that Mann’s basic conclusion is that “we are in a period of unprecedented warming”. Is this the statement you want refuted, that 0.8C warming over one hundred years is unprecedented in the physical history of the Earth? Hokey Schticks are no counter to falling anvils. Comments #44+ are a hijack. Please focus on the thread topic. AGW proponents, peer review does not provide detailed review of either the data or the methods. Articles which are peer reviewed have only passed the Smell Test; i.e. the material in the article is Plausible to use the NAS term of art. Since we know that peer review is nothing close to auditing data and methods, then the question is why anyone would believe the findings of the IPCC unless they did the auditing themselves. Science is about replicating results and independent confirmation of research. This is being done by independent research teams around the world. If an error is found, then another paper is published to refute the original, or confirm and enhance the original findings. The IPCC does not do this. If it is believed the standard Scientific Method has failed in some regard, then it’s time to re-evaluate the Scientific Method, which to date has been amazingly successful. Taking pot shots at he IPCC is just shooting the messenger. Bugs, no, the IPCC is not just an innocent messenger. The spinmeisters who write for the IPCC exaggerate, distort and cherry-pick the science to hype global warming. Steve: Please stop saying untrue things. In respect to Mann’s paper, we stated that his data and methodology did not permit him to conclude that late 20th century temperatures were unique. I believe that we’ve rebutted both his original argument and subsequent attempts to vary his methodology to “get” the same answer. We did not argue that it was impossible to prove 20th century uniqueness, only that Mann had not done so. In various posts at this blog, I’ve shown that other Hockey Team studies are also defective for one reason or another. Again this does not show that it is impossible to show 20th century uniqueness, only that the Team has failed to do so. Eric#67–What is Mann’s basic conclusion and how did he arrive at it? That’s a strawman. Mann’s basic conclusion (i.e. unprecedented warming in 1000 years) is unsupported by his method (i.e. proxy reconstructions). Getting to the “right” answer via flawed methods is not science, it is simply guessing. There’s significant evidence that the claim of unprecedented warming is indeed just plain wrong even if AGW theory is 100% true. That the IPCC downplayed Mann’s contributions in this area is hope that they are at least capable of living up to the role they are expected play in the scientific process. In #42, Steve McIntyre, (whose site, by the way this is, so regardless of what you think ought to happen, his rules apply,) said “In the Mann situation, I was very surprised at the volume of errors and I do not presume from this experience that such error-proneness is characteristic of the field as a whole.” Although, personally, I am no statistician, I was able to follow the Wegman report and take away the conclusion that the “Hockey Stick” needed the shaft. Frankly, as an observer who is as much interested in the words and their use, as in the underlying science or lack, Steve’s comment above is in total disagreement with your quote. And having followed many arguments for some time now, it is becoming clearer, day by day, that, while you want the sceptics to rebut the IPCC line, there is no clear evidence to rebut. No-one that I have been able to discover has a definitive evidence-based exposition of the “settled science”. Science needs to be stated in a way that it can be falsified, if possible. Arm-waving and computer models, the details of which are being kept very close to their modelers chests, do not fit the requirement. I have read several of the earlier on-line items showing the comments of reviewers and the replies, most of which are simply “Rejected”. In something which has the potential ramifications of total economic recession, thoughtful, but dissenting, views deserve more than “Rejected”. The start of the whole problem would seem to be in the initial guidelines, where you see “Its (the IPCC) role is to assess on a comprehensive, objective, open and transparent basis the latest scientific, technical and socio-economic literature produced worldwide relevant to the understanding of the risk of human-induced climate change, its observed and projected impacts and options for adaptation and mitigation.” There is barely even an implicit suggestion that anything else could be going wrong or right. (I know the next is off thread, Steve, but I think it’s relevant.) In fact, as to right, there is a body of opinion, buttressed by much evidence, that increased OCO may very well be good for the Earth on the whole. Altogether, the IPCC does not seem to have followed its mandate to be “objective, open and transparent”. Wriggling best describes that, and it’s a pity that the Senators weren’t better primed with their questions. They let a lot slip that should have been better questioned. #70. In respect to Mann’s paper, we stated that his data and methodology did not permit him to conclude that late 20th century temperatures were unique. We’ve rebutted both his original argument and their subsequent attempts to vary his methodology to “get” the same answer. I realize that many climate scientists feel that absurdities like Wahl and Ammann salvage MBH. However, Wahl and Ammann did not do so for reasons discussed on a number of occasions on the blog. We did not argue that it was impossible to prove 20th century uniqueness, only that Mann had not done so. In various posts at this blog, I’ve shown that other Hockey Team studies are also defective for one reason or another. Again this does not show that it is impossible to show 20th century uniqueness, only that the Team has failed to do so. We did not argue that this meant that AGW was not an issue; all that this proved in respect to other arguments on the matter was that there had been inadequate due diligence processes used by IPCC and climate journals on MBH prior to relying on it so much in IPCC TAR presentations and public policy discussions. Whether due diligence on other arguments has been adequate is something that I’m not presently in a position to comment on. Eric—I know what his conclusoins are, and I know how he arrived at them. Why don’t you read a little bit more and try to understand how and why his “basic conclusions” are so flawed. For instance, his bristle cone pines. I, and we, shouldn’t really cloud this post with these discussions, as has been previously mentioned, but one last point on this issue—if he is so right, why is there so much obfuscation from the AGW camp? Why did Mann hide his data so that no one could try to replicate his studies? Or, when asking very relevant questions, for example at RC, on gets non-posted, or some bone headed analogy that makes no sense.—You see the AGW camp doesn’t want to answer questions, they want to force their conclusion down everyone else’s throat. Please Eric, you are in a cloud and you must read your way out of it, no more hand-waving. This is the roses in the hothouse argument … the only problem is that roses do not have global climates … nor do they have human civilizations dwelling on their surfaces that hang in the balance. In all events, as best we know, civilization has only thrived in this, the Holocene, and it appers that the Holocene is giving way to the [fill in the blank] … and you want to play craps with “OCO” because it “may” be good for the earth. Sounds like you are playing with loaded dice to me. Steve: please save the histrionics. All of us are here because we believe that the issue is an important one and that it’s worth getting the science right. This effort is not helped by the use of incorrect statistical methods, such as you appear to endorse in the case of MBH. Steve: snip – Eric, please respond to #73 before you get involved with other red herrings. Does anyone else get the feeling that an “Eric” or someone similar gets thrown into this site from time to time just to attempt to find a weak link or sidetrack the issue? I think there is an old crusty house somewhere where all of these “throw ins” are sent afterwards to try and regain their sanity, their tears are wiped and their noses blown and a reassuring line of “don’t worry the next one we send will definitely break them down”. Your most recent response didn’t seem to be directed at me, but I’m still trying to understand what “Mann’s basic conclusion” is. You suggest we look at Mann’s testimony before the Senate. 1. The atmospheric concentration of GHGs is higher than at any time in the last 400k years. 2. The increase in atmospheric GHGs is undeniably due to the activity of human beings through fossil fuel burning. 3. Late 20th century warming (1950-2000?) is unprecedented in modern climate history (Holocene?) at hemispheric scales. 4. Late 20th century warming is almost certainly (R^2 greater than 95%?) a result of the increase in GHGs. 5. 0.6°C global temperature increase relative to 1990 levels by the mid 20th century would take global average tempurature well beyond any previous levels of warmth seen over at least the past couple millennia (2k years?). 6. The rate of warming in the late 20th century is unprecedented. Are these the statements you would like to see refuted? Steve, thank you kindly for all of your insite and work. Curiously, as has been mentioned previously, the primary role of the IPCC “is to assess on a comprehensive, objective, open and transparent basis”…..
Steve, where is the objectivity in their presentation??? Have you confronted this prevelant bias issue head-on with them? 73:In response … as requested. Steve, is this critique wrong? Steve: Yes. You might consider the Wegman Report and the specific statements by the NAS panel on our work – google through the NAS report on MCIntyre and then tell me if you see any point on which they said were incorrect. Please also note that this realclimate article was a pre-emptive strike against our then forthcoming 2005 articles, which had not even been published at that time. Please read our articles. The data does not disprove the “warming” is unprecedented, but it doesn’t prove it either. The signs are it is not unprecedented. Clearly, .8 is not unprecidented. My opinion is that the anomaly is mainly a byproduct of measurements and computations and may or may not reflect actual warming, and that there is no such thing as a “global temperature” to track in the first place. If there is actual warming, it may be more or less than the anomaly reflects, and is probably mostly due to land use changes (70%? 80%? ), with the AGHG providing some boost to the system. If so, then at most, CO2 is 1/2 of whatever isn’t land use. See the below graphic. I must also mention that if we talk about CO2 warming we might as well talk about aerosols cooling. 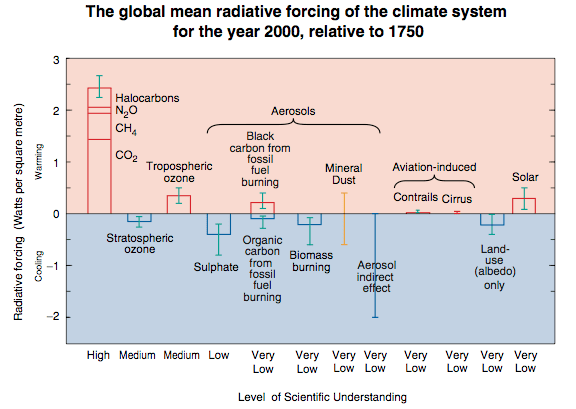 So as far as stating opinions of subjects with vast uncertainties as fact, I point to this: http://en.wikipedia.org/wiki/Image:Radiative-forcings.svg and its error bars. Remember that all but the AGHG are qualified as poorly understood on a scientific basis by the IPCC. However, as I believe the circumstantial evidence (ocean heat by satellite, melting glaciers, and so on) is best described by particulates being deposited on snow, on ice and into the ocean, since these are the byproduct of burning fossil fuels, whatever changes we’re seeing are antropogenic. However, if I cover glacier ice with soot, it melts, no warmer air required to make it melt. Of course, ocean cirulcation patterns can explain ice melting in the water, regardless of the cause. Whatever. In addition, one must remember that 2007 had the satellite readings of the troposphere drop over .5C, so that particular measurement went into negative anomaly territory. Regardless, the IPCC certainly seems to not be meeting its mandate, and the publications and actions certainly give the appearance to be mostly political in nature. who equally engage in the same. He does, on a regular basis. ^Paul: yes, though I suspect often it is merely a result of individuals that hear about this site, then want to investigate whether or not their theory is really in trouble. You’ll often hear comments about the “armor” only getting chinked, which is an obvious tell (poker term) of an emotional investment. I think the role of the IPCC is corrupted as much by individual bias to protect pet theories/beliefs as it is by politics, perhaps even more. Allowing individuals to review their own work, then write the summaries is evidence of that. Such a corruption does not even have to be intentional to have an impact on the objectivity. I think that’s the same sort of group-think that Dr. Wegman was talking about. The ‘good old boy network’ thing. Yup. The political influence is likely why such a lack of objectivity is allowed. I have not seen any clear evidence of it driving any of the analysis (though there seems to be some implied “pressure” which has been mentioned in the press on occasion). I just read the Wegman report again. It does not refute Mann’s basic conclusion. It does gripe about the 90s being the hottest, and all that. But, it does not invalidate the bigger and basic conclusion of the analysis. Steve: I referred to the Wegman Report in connection with your query as to Mann’s supposed realclimate rebuttal -which was not one. The evidence that Mann could not make his claims based on his data and methods was made in our articles. 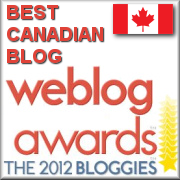 Wegman’s opinion was that our articles made sense and that Mann’s was wrong. Wegman said clearly that you can’t get a Right Answer with a Wrong Method. The “big” conclusion of MBH was that they could say with statistical confidence that the 1990s were the warmest decade of the millennium. Perhaps they were, perhaps they weren’t. Mann’s analysis has no relevant information on the matter. If you care to dispute any specific item in our criticisms, I’ll do so, but please try to comment in light of things that I’ve written on the topic. I’ve never been in a group dynamic where one or more people were more forceful/charismatic/persuasive/considered to be more expert etc than the others…. When you come into a situation where there are relative ranks, I’ve more often than not found that the people up at the top were not very good at either doing work or leading. It’s usually a case of them being good at management, most often by manipulating guilt, causing fear, etc. Still sticking to the strawman, eh Eric? You are living proof of my hypothesis above… Btw, the term “unsupported by the evidence” is as close to “refutation” in science as one can get. Eric: Are you unable to read? Is your arm getting tired from all that waving? Think what you may of AGW, the report is quite clear. Mann himself admits he’s no statistician. There is no debate. Let me make it simple for you. I’ll paraphrase the below two paragraphs from the summary. M&M clearly and correctly pointed out the discrepencies in the hard to read MBH. MBH didn’t have the correct calibration period and it messed up the PCA. They missed it because they’re not statisticians and didn’t get any to help them. Paleoclimate people rely too much on peer-review, especially how closely knit the reviewers are to to the authors. They don’t seem to want to have anyone else look at their work. Some of their behaviors give bad impressions. In any case, their analysis doesn’t support the claim that the 90’s were the hottest decade in 1000 years or that 1998 was the hottest in 1000 years. In reading your stuff, it appears to me that all that you have done is belittled Amman and Wahl without actually refuting what they did. Also, the North report is far more generous. And, what about Von Storch? Nothing seems to add up as you say … the “big” conclusion (which is bigger than the 90s) sticks. #90. I don’t have time to debate Wahl and Ammann with you. Look at some of my back posts in the Wahl and Ammann category. If you want to contest a specific point, fine, but please stop the generalities. Specific results on the impact of 2 or 5 PCs or inclusion/exclusion of bristlecones are all in our EE 2005 paper. So Wahl and Ammann confimed many of our statements in that report, although they failed to reconcile this. YEs, you can “get” a HS using enough PCs to catch the bristlecones or by using “all” the proxies in one of the most overfitted multiple inverse regressions in history, but each artifice runs into a different problem. And regardless of the artifice, they still get a verification r2 of 0. Remember Mann’s assertion that his reconstruction was “robust” to the presence/absence of bristlecones. THis is false. He can’t get it without the bristlecones – Wahl and Ammann agree. So the reconstruction is not robust. If you do a multiple inverse (PLS) regression in a calibration period of 79 years using 90 proxies or so, you can get an excellent fit in the calibration period. Does that mean you can use calibration period residuals to estimate uncertainties? Of course not. It’s even worse than the original. You;d think that climate scientists would realize this without me having to pick every spitball off the wall. As far as the “Role of the IPCC”, I might expand on the written summary of “role” and note several things. 2. The IPCC fades into? Future short term climate affects peoples’ attitudes about climate change, and new science rolls in with clarifications. Against these stands the eternal desire of governments to find new means of taxation and revenue enhancement. Indeed , it would seem that if by chance the next years show (or appear to show) additional warming, then the role of the IPCC in the future warms also. But if the next several years show no warming or show cooling, then I would argue that this gamble of the UN was lost. Steve: I think that it is appropriate to look at the stated objectives. Speculations on “expanding bureaucracy” are not the sort of thing that I want to discuss here and add nothing to the discussion. That wording should be something like: “criticism made by”. The way it is expressed in the report is capable of having two meanings, and therefor of being misunderstood. Uh, you mean like the Almagre bristlecones that Steve and Pete cored and are working on? This makes me rather doubt a bit your claim you’ve read this site. Just to give you the benefit of the doubt that you somehow overlooked it. Search for Almagre on CA. Never said that I read the entire site. Are we then to anticipate a complete proxy study .. with conclusions … published and all? Let me ask you a question. If it’s so easy to disprove that coring trees is difficult and expensive and takes huge amounts of time, what does that say about somebody who claims that? Why would somebody in the dendro world not update the proxies and not archive the results? More here on other issues: http://www.climateaudit.org/?p=2322 Read what Dr. North and Mr. Bloomfield say to Charman Barton. This is not a matter of trying to refute or prove specific aspects of AGW or deny something seems to be going on. It is simply that the methods have issues, and it seems nobody “on the inside” (those producing them) care to deal with those issues. I would categorize this all as: We don’t care what the truth is, we just want to know what it is, and be at least somewhat specific in our choice of words describing things. There is a lot of scientific uncertainty. What’s wrong with admitting it? That means proper cost/benefit analysis needs to be done before taking action. Clearly, anything perceived to be both dangerous and probable should be taken care of. But to just demand action on expensive solutions with no way to measure the effectiveness of that solution is not something most policy people would (or should) implement. Nobody has a lock on spin; I forget the quote, but I’ve seen the same said the other way; “we need to hype up the dangers, regardless if they’re real or not, to get action done”. I’m not exactly sure what battle you are fighting. I think you are mistaken in thinking the hockey stick and the IPCC are merely scientific studies that shouldn’t be scrutinized by non-climate scientists. I view the IPCC as an agency designated with the role of determining negative consequences of AGW and promoting “options for adaptation and mitigation”. A majority of the members of the IPCC are not scientists but rather heads of state, governmental advisors, etc… The IPCC does not promote that “science is not settled”, or “wait and see”, or maybe do nothing. The IPCC promotes reducing CO2 emissions. I think a proper parallel analogy is the IPCC is preparing a global climate EIR (environmental impact report). They have stated what temperatures have been in the past, what temperatures are now and what they will be. They also state what consequences rising temperatures will have globally. The IPCC also attributes blame for those temperature changes to human induced greenhouse gasses. Mann and his team knew full well the role of the IPCC when their proxy temperature study was made public and was to be prominently featured in an IPCC report. They didn’t say look Mann has just received his PHD and our study is only a study and you may include it but don’t place too much weight on it. They promoted it as truth as they still promote it. So the IPCC presented an EIR that showed global climate to be relatively stabile over a thousand years and fitting into a tight bandwidth until recently when temperatures spiked. At that point the hockey stick was no longer just a scientific study, but part of an engineering report. Then MM finds errors with the proxies and the statistics and submit their findings to trade journals. The U.S government gets involved and haul Mann and all before congressional hearings because so much is riding on the outcome of the hockey stick.. They bring in Wegman who provides his own evaluation which states the statistics don’t prove what Mann and all state. Say you hired and environmental engineering agency to provide an EIR for a property you wanted to develop. The EIR report says there is a spotted toad that is endangered and protected and development would harm its habitat. So for 5 years you sit on your now worthless land. You hire another firm who shows it is not the spotted toad but the common spitting toad which is neither endangered nor protected. So now you can develop but you have lost 5 years. 1. Use the original environmental agency again or allow your friends to use them? 2. Consider the agency wasn’t liable because it was really just science. And science needs a broad realm free from liability? 3. Consider the agency’s opinion to be valid on any other engineering issues? I am presuming the answer to all of the above questions would be no. One doesn’t need to be a scientist, engineer or politician to disapprove of the errors. This is why so many of us take exception to Mann and his studies (and the IPCC). He allowed a speculative study to be featured in a project that was not pure science, but was essentially an engineering project. The outcome had/has political and economic consequences. His work was flawed and his statistical results were neither accurate nor robust. It makes no difference whether he was deliberately sloppy or negligent or not. Engineering does not care about intent, only results. So maybe there is problematic anthropogenic global climate change. We can’t deduce this from Mann or the IPCC. #98 And this, folks, is *exactly* why there are alarmist spinmeisters that are in absolute denial of the real uncertainty that undeniably exists. They think they are countering some subversive republican movement, when what they are actually countering is honest science. When I say “uncertainty” I’m not talking about confusion or lack of awareness, although there’s plenty of that. I’m talking about statistical imprecision of parameter estimates in attribution models. Models that have never been audited. Policymakers don’t want to hear it. And climate science is taking a beating for it. Read those pdfs posted by Dr Curry, especially the one by Byerly. Good policymakers and scientists care deeply about uncertainty. Agenda-pushing alarmists do not. Eric: You’re boring me. Iv’e sent for the transport and they have a room ready for you. Next. Does this mean that you believe supporters of AGW should claim that there is no dissension, despite the fact that there is. Just so they can move public opinion? I thought you were claiming your guys were scientists, now you are urging them to be politicians. I’ve seen several quotes, including one recently from Gore, that it doesn’t matter whether AGW is true or not, since the things it requires us to do, are things we should be doing anyway. I am happy to have people like Steve do what they are doing. I just wish that he and others like him would be more transparent with their bias. If, for example, Steve came out and said publically, “You know, I have worked in and around the business of mining, etc., all my life … I have fed my children on the hard earned money that I made in that business … I will retire on the holdings that I continue to have in that business … and I don’t want to see that undone by potentially bad science. So, yes, I am against AGW at all costs and I am going to hold its proponents’ feet to the fire until the bitter end.” If he said that, I would know exactly where he stood … and so would the rest of the public … and I would respect his clear and honest position. But, pretending to be essentially neutral on the topic and to not to have a bias is dodgy and misleading … and prevents the public from truly weighing the credibility of the evidence presented in the debate. That’s my beef with all of this. Why do you feel that someone who doesn’t agree that AGW is going to kill us unless stopped, is biased against AGW. Isn’t it possible that he is just biased towards good science? I suspect what Eric is complaining about is that Steve’s behavior makes it more difficult to label him an industry bought and paid for shill which makes it harder to rationalize ignoring what he has to say by claiming he’s a part of an evil corporate conspiracy. Eric McFarland with the initials of EDM, what are you hiding? Your initials don’t match your name, that’s my beef with all of this. Transparency if you choose to read, opaque if you choose to posit untenable arguments.—-What on Earth does mining interests have to do with not archiving data or with inept statistical analysis? If this was an RC post, and you portrayed any inkling of sceptism, your thoughts would never, never have made it into the postings, but in your world that would be transparent, wouldn’t though? You really should stop this obfuscation because in this battle of wits you are seriously un-armed. Where is the beef, Eric? Surely not that strawfed beast you behold. Eric D. McFarland would be EDM. Anyway. That is a key question; why is this debate on AGW so partisan? It’s a political issue, that’s why. As far as your views on Steve, Eric, he won’t come out and say that because that’s not his standpoint. Why can’t you just take what he says at face value? There’s no reason somebody interested in checking the statistical robustness or asking that scientific methods be transparent and replicable has to have a political axe to grind. MarkW; It seems to me it’s almost always a matter of “If you don’t totally agree with us, you are a denier and don’t care about mother Earth and our future generations, and are an evil anti-environmental conservative Republican.” Something like that. “”Who paid for your research? If you think scientists are immune from bias then you should read this. Since you are polite and seem well-intentioned, your bet bet for understanding what’s going on here at Climate Audit is to start at http://climateaudit101.wikispot.org and do some reading. Note: the wiki is definitely a WIP! Unlike most other climate-change blogs and sites, Steve McIntyre is straightforward, and is trying to do just what he says: audit the basic scientific documents that have lead to the conclusion (by IPCC et al.) that the world is warming dangerously, and by fuel-burning emissions. In the non-summary science WGI stuff, “the IPCC” says that it’s land-use change and burning fossil fuels. Sam U–I thought that if I said Eric McFarlands initials don’t match EDM enough, that it would become true…isn’t this the same with the AGW camp? Surely it is the same logic that EDM is using, is it not? Repeating things enough to make them become true? Sometimes. I think in this case it’s either ignoring obvious conclusions or reading too much into things.